Double Killer searches single or multiple folders/partitions for identical files. Files can be compared by name, size, date and/or CRC32 checksums. Masks like *.mp*g or *.dll are supported and files with certain attributes (e.g. hidden files, may be excluded from the search). When the search is finished a list containing all double files found is displayed and you can select the files which should be deleted or moved. Although fully functional, a pro version is available for commercial use and has some advanced features. Note: the main site has had some intermittent issues so we are linking to Softpedia. How to extract: Download the ZIP package and extract to a folder of your choice. Launch DoubleKiller.exe. Allen: confirmed ... updating links. I stand by my last post, but this app doesn't do what I explained above as nicely or automatically as I was thinking. Guess I should test before posting from now on? For one, you have to manually select all subfolders and I don't think this one has an "automatic mode" to just delete all matching files without user interaction. I'm sure there's a duplicate deletion app out there that will do as I explained above though, and I'll find it. This is an amazing solution to the whole "deleted files" problem with most file synchronization apps, when the filesynchronizer has to ask you whether this or that file should be added to this side or deleted from that one or just takes the wrong action automatically. You can, for instance, have all your IE or Firefox favorites (if you're using FF's PlainOldFavorites extension) on two different computers with folders shared, make it a point to, instead of deleting files, move them to a "trash folder" you create (not the recycle bin). 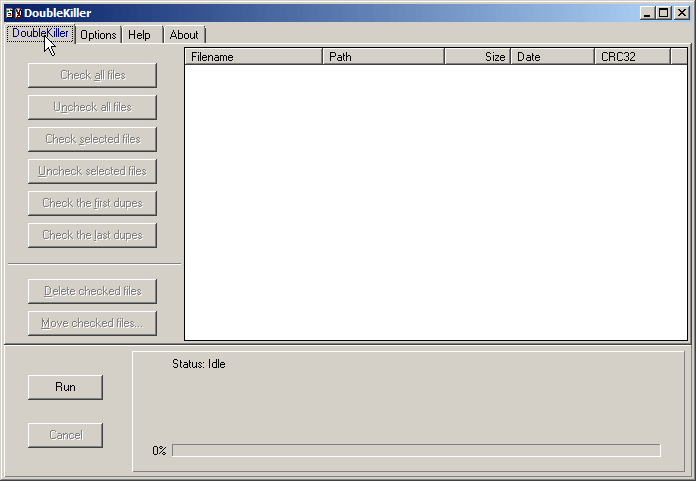 Then, in a batch file before the sync app runs, let this app check for anything in the second computer's favorites that match anything in the local computer's "trash folder" and delete them and vice versa comparing the local favorites with the second computer's "trash" folder. If you wanted to, you could even set up a shortcut to the "trash folder" in the sendto folder for easy access when you want to get rid of something. And probably the third step in the batch file after synchronization happens, would be to delete the contents of the "trash folder". this program has an added feature which allows you to check all "1st" or all "2nd" files which saves a lot of manual work. Also, it gives you the option of moving the duplicate files (including the structure) to another location. Often you have exactly the same file named as something else and this program will help you track it down. The only duplicate-finding program I've found that doesn't work purely by file name, which is often inadequate. Cool. Wasn't sure if the newest version was still classified as portable or not. Thanks for the info. I have updated the database entry to reflect the latest version. i noticed that the version on the dev's homepage is 1.6.1.80. is there a reason that PFW does not have that one listed?